you wandered the empty rooms with the real estate lady. spare-room doors one by one. Photographer’s Note: This poem represents a ping-pong of thoughts between present and past, a struggle between what is and what was. 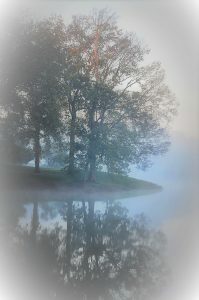 I chose this photo because it represents a quiet place to sit alone with your thoughts (serene), reflect on your past (literal reflections), dream big dreams, and try to work your way out of a state of confusion (fog). The slightest bit of sunshine always signifies new hope, even when an Instagram search creates that twinge of discontent.